With Behind The Scenes, we want to give you a sneak peek into our working process, so you could better understand how our approach is put into practice, who we are as people, and how can your business benefit from it. Interactio is our first success case that we want to present in these series. As we’ve recently started to implement the digital strategy we created for them, for now we’re only sharing our process. The post will be updated with more actual data in the future. So, what is Interactio exactly? Enter Interactio, a mobile app that is on its way to revolutionize the way interpretation is happening during live events. Already trusted by such solid organizations as TEDx, European Commission and Microsoft, Interactio is making lives for event managers, attendees and interpreters much easier and more exciting. And we’re here to help them turn this revolution into the new status quo. 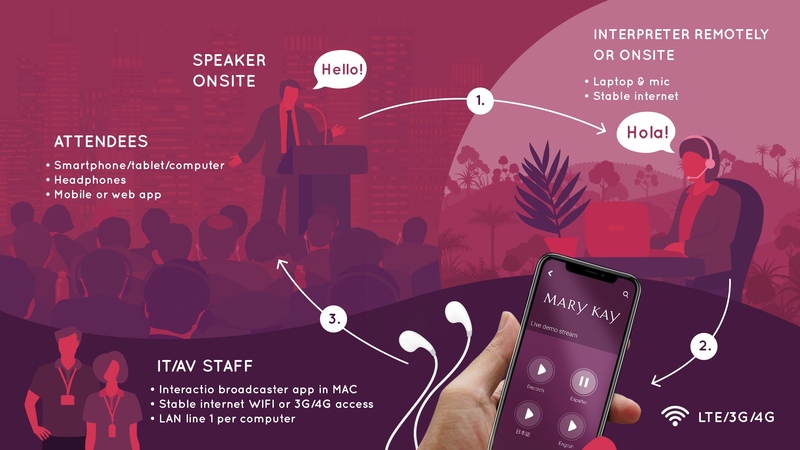 Interactio is a mobile system that streams real-time audio in attendees’ phones and fully replaces traditional translation hardware for live events. It’s here to solve such problems for event organizers as assembling translation booths, managing all the logistics related with interpreters, and fixing broken or looking for lost earphones or any other traditional translation hardware. It’s also a breath of fresh air for attendees who would much rather grab a cup of coffee and chat with their peers instead of standing in long lines to pick up their set of headphones. Finally, it’s a game-changer for interpreters, too, as now they have an opportunity to work remotely from anywhere in the world! The main reason why Interactio turned to us is that most sales come from outbound marketing. There were some sporadic digital marketing efforts in the past, but they did not bring wanted results. Why? Interactio had no digital strategy. However, they felt that they were missing out on something great. They were very eager to make use of untapped inbound marketing and turned to us for help. 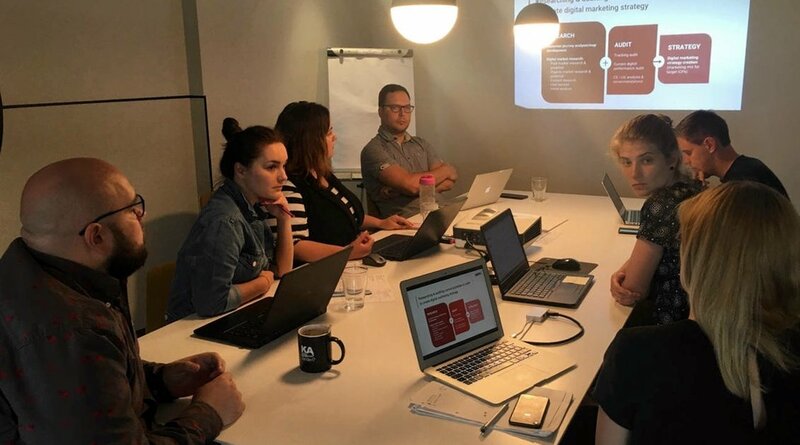 A week later, all the preliminary team met at our office with Interactio’s Simona Andrijauskaitė, a co-founder and Head of Sales and Marketing. Even though it was our first official meeting, we decided that it would be wiser to bring in not only a project manager and a strategist, but the specialists, too (there were 6 main specialists that were constantly working just with Interactio and 2 more that would step in when needed). This way, by getting involved directly from the first meeting, the specialists had the opportunity to hear all the information they needed first-hand and ask all the questions they had. We hit it off right from the start. We were very curious about Interactio and their product. And we saw how we could help them grow. But it wasn’t all rainbows and sunshine. Because Interactio’s solution is very innovative, it’s still mostly unknown to its target audience. What does that mean? There’s not that much data to work with and, for a performance-driven agency, that can be a little bit difficult, to put it lightly. How can you improve UX when you don’t have enough traffic to test a different hypothesis? How can you plan PPC budgets when there’s no real competition in the market and you are not sure what’s your perfect target audience? We wanted to grab onto something, so with UX, PPC, SEO and Content in mind, we started by picking low-hanging fruits. We carried out a complete channel audit and planned the next possible steps. Then we turned to the market research, analyzed the direct and indirect competitors. The next step was to synthesize the information gathered. All parts of the research and audit of different channels were carried out by different specialists. And even though they are experts in their fields, at first it was a bit of a challenge to put the pieces of the puzzle together. But that’s where our strategists came in. All of the specialists involved and 2 strategists head over to the drawing board to synthesize the information gathered. We were not thinking of separate tactics - we worked on the overall digital strategy. We were thinking holistically. We analyzed user behaviors for every stage of Interactio’s funnel, set objectives for each stage, and only then designed specific tactics to reach them. Now Interactio had a complete roadmap, a clear, reasoned destination - not just separate short-term oriented goals. We were very serious about the product research. We not only analyzed the app, the website, the market, but we also worked closely with Interactio sales team to get as many touch points as possible. We listened to their sales calls for hours. We joked around coffee breaks and motivated each other throughout the process. We also went to one of the conferences where Interactio system was used for simultaneous interpretation to see how it works first-hand to have the ultimate understanding. When discussing the strategy between in our team, we naturally adopted the mindset of the client. We tried to agree on solutions as if we were in their shoes. All 6 of us (and a couple more when needed) were focused just on Interactio and sometimes even put other clients aside which is not a common practice in digital marketing agencies, but it was vital to keep the momentum. It’s not about just rounding up the most experienced professionals when it comes to getting things done. Expertise matters, but what matters even more is the natural drive for results. We in our accelerator are lucky to have both. When creating the strategy for Interactio, our specialists were especially involved in the process and did all they could to optimize their time and work efficiently. We deep-dived so much into their business, at the end of the day we all felt like it’s our own company we’re working for. We believe that this true partnership was the key element of our success. We confirmed our thoughts - inbound marketing had, indeed, huge potential. For example, we identified 3 additional target audiences that Interactio were not aware of themselves. And by educating these potential users on every stage of their buyer’s journey and creating value for them, we can achieve much higher results than by simply cold calling them. We created a holistic strategy for Interactio that would pave the way for their sustainable growth. Our way - to explain the key changes in the simultaneous translation industry to event managers and to test various channels to reach event managers. Our research revealed the unrealized potential both in owned, earned and paid media channels. We compiled an extensive research and tactics based on the findings. We’ve already picked many of the low-hanging fruits. Our analysis also revealed that market leadership in Interactio’s niche simply does not exist. It means that we have all the opportunities to set the benchmark ourselves, we only need to do it wisely. From the first glance, it looks like a good idea to create content using a lot of keywords that have big volume because these keywords are likely to attract a lot of traffic. Who wouldn’t like 16,531% organic growth (see the table below)? However, the truth is that you don’t necessarily want this kind of traffic. We carried out extensive keyword research and we came to the conclusion that in Interactio’s case such standard approach to growth will not truly work. Why though? The answer is user intent. What does it mean? They don’t know what they’re looking for when they turn to Google. They are aware of the problems they have but most of them have no clue about Interactio’s solution. Also, we found out that B2B keywords in translation industry are intertwined with B2C keywords. For instance, when users type “translation app”, they’re not looking for simultaneous translation app for big scale events that involves human interpreters (Interactio’s solution), they’re most probably interested in some sort of Google Translate equivalent which they could use in their own day-to-day activities, say when traveling. Which, for us, means that we should not be tempted by this keyword even if at first it looks very appealing - there simply would be no real value in such traffic because what we offer does not match their intent. In other words, hello bounce rate, how have you been? So, what should we do in such case? 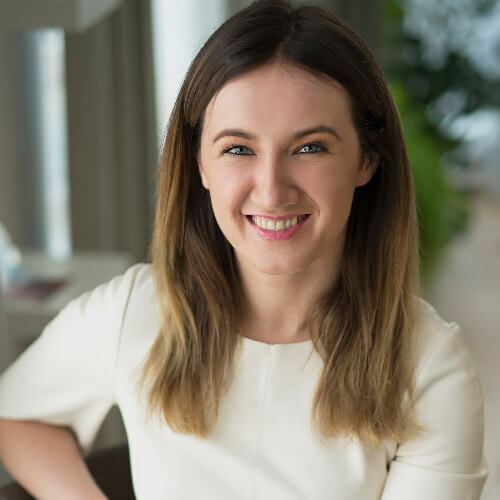 Our SEO Team Lead Kamilė Sinkevičiūtė says that we should be looking for more specific keywords. Even if they don’t look that promising at first glance because they have significantly lower volume, they are a much wiser choice for long-term results. By narrowing your audience and covering every stage of the buyer’s journey with appropriately chosen specific keywords, you’re much less likely to disappoint them and they, in turn, are much more likely to convert. At this point we’re in the early stages of starting to implement our inbound strategy, so it’s too early to speak about the actual results. Our goal is to help Interactio take over the simultaneous translation market by positioning them as its voice. So when event managers think of translating their events, they think of Interactio. For instance, To make our target market aware of Interactio we will strive for a wider reach and more impressions through advertising and publicity promotional mix. For that, we will be able to create new content and distribute it in relevant channels. Implementing long-term growth strategies takes time - there’s still a long way to go with Interactio. But in just 3 months of working together, we already see pretty great results. By picking up these low hanging fruits, in just 3 months, we saw a +72% growth of sessions average per month (2018 January - 2018 June vs 2018 July - 2018 October). But that’s not all we’ve been doing. All of this was reached even without implementing a blog, or other content strategies. Which makes us very excited about what’s yet to come. What’s even better, during the same period, there was a +134% growth of conversions average per month. And what is a session without conversion, right?